Four blog posts so far today – Art, Dance, Poetry and now Hip Hop Shakespeare! This library tour is a great idea and rapping Shakespeare is rather cool. 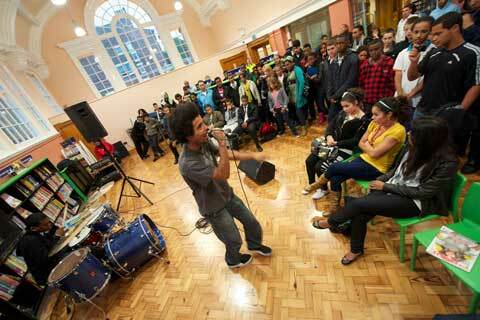 AWARD-winning hip-hop star Akala played a special, invitation-only evening gig for young people at Toxteth Library. More than 120 young people from Toxteth-based music and writing groups were invited to attend the 108-year-old library, which has recently undergone a £1.3m makeover including the creation of a new exhibition and performance space. His performance was part of a tour of libraries across the country this summer. The tour is in partnership with the national charity The Reading Agency and Akala’s Hip-hop Shakespeare Company: it is part of a major drive to fire up young people about reading and transform the way they think about libraries. Events will take place in libraries across the UK, with the final show taking place at the British Library in London in November. The free evening shows consist of a half hour performance by Akala, accompanied by the renowned drummer Cassell ‘The Beatmaker.’ These are followed by a Q&A session with Akala about how his love for reading has influenced his new album DoubleThink – inspired by three works of dystopian fiction: George Orwell’s 1984, Aldous Huxley’s Brave New World and Yevgeny Zamyatin’s We. Akala’s tour is part of The Reading Agency’s campaign to bring reading into the 21st century, and inspire more teenagers to read and get involved in creative activities. In recent months keen celebrity readers and authors, including Sophie Dahl and Michelle Gayle, have taken part in activities to bring reading and libraries to life for young people. Library staff were also delighted that over 16 of the books featured in the event were borrowed on the night, with some people joining the library to do so. Ruth Harrison, project manager at The Reading Agency, said: ”At The Reading Agency, we want to transform the way libraries engage with young people and broaden the definition of reading. What better way to do this than bringing an acclaimed hip-hop artist such as Akala to libraries around the country, to perform and talk about how reading has inspired his own work.